MANILA, Philippines – Equating a storm surge to a “tsunami,” or saying it is “tsunami-like,” is inaccurate, dangerous, and irresponsible. This was what Dr. Mahar Lagmay, executive director of the Nationwide Operational Assessment of Hazards (Project NOAH), told reporters during a media workshop on communicating climate change and disasters Tuesday, November 26. Before the calamity, few people understood the term “storm surge”; on the other hand, everyone knows what a tsunami is. However, even if both phenomena involve the rise of sea water that can cause massive flooding, they are essentially different events. A storm surge is water pushed inland by very strong winds, usually during very strong typhoons; on the other hand, a tsunami happens when water is displaced by earthquakes. This difference cannot be disregarded for the sake of better visualization, said Lagmay, and could be dangerous if misunderstood or miscommunicated. People should react and prepare differently for tsunamis and storm surges, he said. In the case of a storm surge, there is more time to prepare and get one’s bearings. Technology, such asthe one Project NOAH is developing, allows people to predict a storm surge days before it happens. 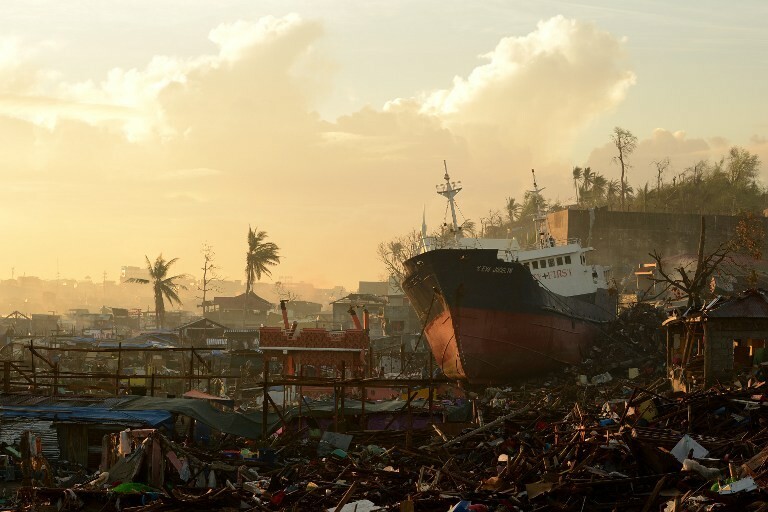 In the case of Yolanda, storm surge predictions were made as early as two days before the typhoon made landfall on November 8; Project NOAH even warned which localities were to be hit by the surges a day before. “Because you are given two days’ advance warning, you can have a planned evacuation. Evacuation is steady. You don’t create panic. You don’t create confusion. You don’t create a stampede,” Lagmay explained. If Taclobanons were told on November 6 that they should expect something “tsunami-like,” chances are they would’ve run to higher ground that same day – and get confused. “And when they get there they will ask, ‘Saan yung tsunami? Saan yung earthquake? Wala naman eh (Where’s the tsunami? Where’s the earthquake? There’s none),'” said Lagmay. The night before Yolanda hit, President Benigno Aquino III even mentioned the threat of storm surges during his televised address to the nation. “The media was also able to pick it up and describe accurately what a storm surge is,” he said. But in the future, he agreed that more visual, high-impact content is needed, such as public service announcements about storm surges. Educating local government officials long before any threat of calamity is also vital. Some also say a Filipino term for storm surge can be helpful. At present, there is no direct translation for the said term, but there are suggestions popping up. “Daluyong” or “daloyong,” an ancient Tagalog word for waves, was one suggestion. The city of Mandaluyong derives its name from the said term; according to the late historian Nick Joaquin, “Mandaluyong” means “a place of waves,” referring to the wave-like appearance of its hills back in the old days. But young historian Pepe Alas prefers the term “hombac” or “humbak,” which is historian Jaime Tiongson’s candidate for a storm surge term. Alas writes in his blog that a 17th-century Spanish-Tagalog dictionary uses “hombac” to describe a phenomenon very similar to a storm surge. The definition of “hombac” associates it with storms or a strong, violent surge of water.